Wednesdays are typically our day without many plans since it is the day between her two school days. I find it nice to have a day to play at home and spend time together. This morning was one of those days I was glad we did not have plans as it was snowing harder than they predicted. 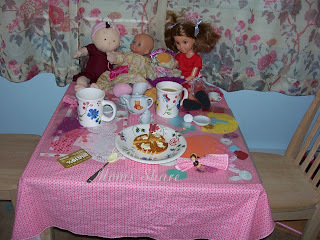 Our big plans for today was to have a tea party after breakfast and getting dressed. I made the tea during breakfast so it would be cool enough for Hazel by the time we got to the party. Our next step was to get dressed and accessorized and then we had to dress all of our guests. 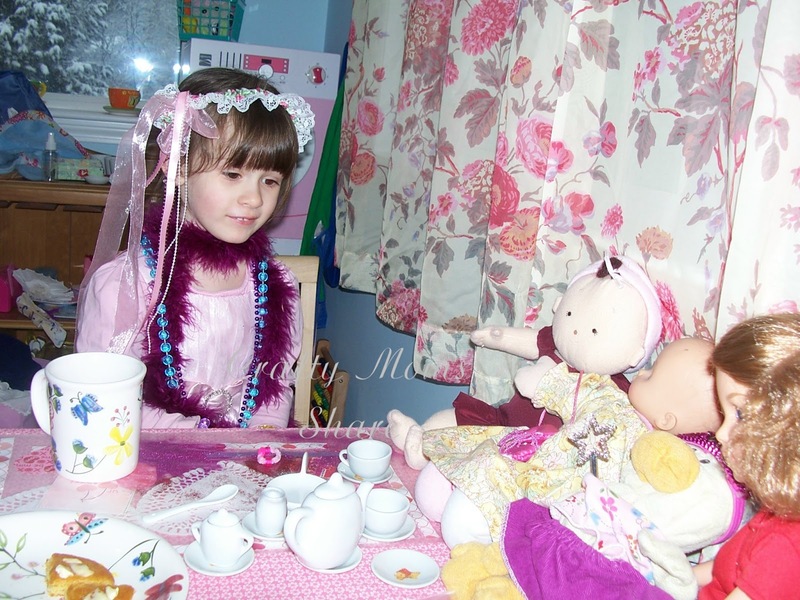 Hazel wore her favorite pink dress and then piled on the jewelry. I told her she looked like she was from the 80's with all the bracelets (think Madonna or Cyndi Lauper). She basically put on every bracelet she could find and every ring. 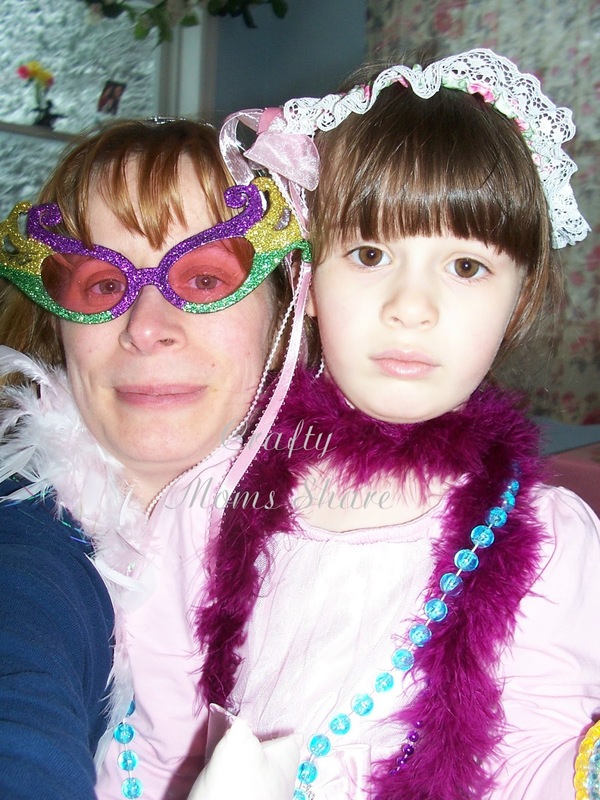 You cannot see it, but she did pick out a tiara which I am wearing in the picture above. Then we poured the tea for our guests and got ours and our real snack (corn muffin top) ready. She loved this part. We even got a special guest who we gave a plastic cup to since she probably would have broken one of the porcelain ones. I think she was a bit more interested in the pom poms and wands Hazel insisted we carry to the tea party. We had put them on the floor by the table and Fluffy was definitely keeping an eye on them. Of course her favorite part was that we would choose one of the dolls or Ducky to need more tea. Then after the corn muffin was gone she wanted me to cut up some apple. Needless to say it was a very fun morning. After lunch we changed and put on our layers to go outside. Now the snow had turned to rain and it was wet and very heavy outside. However she really wanted to go play in it, so we did. 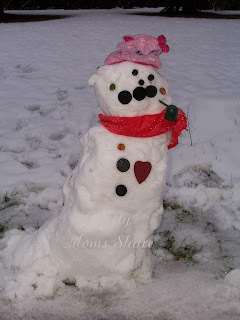 After all, she has been wanting to make a big snowman for a couple of years now and we have not had a good snow for it. Well we did some shoveling and made a snowman and she made many snow angels. I think this might have been her biggest snowman yet. We used almost all of the snow that was on the driveway next to our garage. It made shoveling much easier after rolling it all into the snowman. 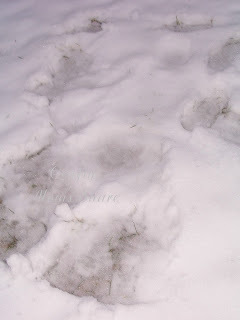 She also loved making footprints and dropping her shovel to make its footprint and handprints too in the snow. Afterward we came in for hot chocolate (well I had tea) and warmed up. By then the roads were clear so we went out to run some errands as well. 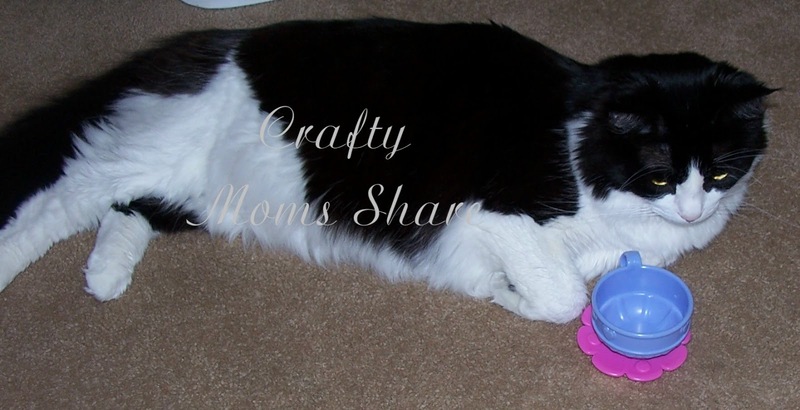 We spent some time doing some crafts together, but I will share those another time. Have you done anything fun this week with your kids? I love that you each wore special costumes! Such a great idea. Thanks for linking at Family Fun Friday. What a creative way to have fun!